Earlier this week, I came across yet another documentary on World War II. Watching it became one of those moments in life when you decided to take a plunge but come out on the other side thanking heavens that you actually did it. This very modern documentary, by French producers in 2009 to coincide with the 70th anniversary of the most destructive war in history, is simply breathtaking. As a student of history, and one who focused on War War II history in high school, I thought I've seen it all. I thought that I've found as many documentaries and footages as I could have found and watched them all to better my understanding and to increase my knowledge about this momentous point in history which, quite literally, turned the world upside down. But, after watching this, I realised I haven't seen it all and I'm ashamed to have ever thought that I ever did. Most of the time while watching, and being completely entranced by this documentary, I kept thinking to myself: "How on earth did some of these incredible footages get filmed." At some point, I actually thought they were elaborate filming techniques or some kind of effect. They weren't. 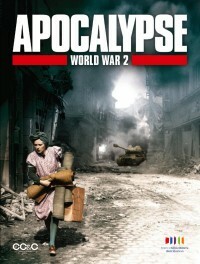 No movie, nothing Hollywood could ever produce, can show you this side of World War II. 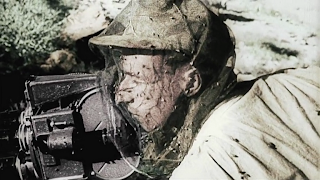 These footages, a lot of them only recently declassified and digitally enhanced, were filmed by propaganda camera crews from every side of the war, or simple home videos. Trust me, you will never have seen the war like this - a first person view showing just how destructive human beings can turn out to be. Throughout the series, there were no holding back like in traditional documentaries. Dead bodies were just that. Mangled bodies, also shown as it is. The result of the mass killings and torture by pretty much every side were displayed in their true horrendous form. The only moment when an image was blurred was the scene of the mangled body of Benito Mussolini, whose face is no longer recognisable at this point after being beaten by the mobs (I've seen the unblurred photos), was shown being paraded in Italy after his downfall. You felt the pain, the suffering, the devastation. You felt the bombs fall next to you. You can hear the screams, the anguish, the cries. You feel the desperation. You feel the love of families, and the bravery of men, women and children around the world. What finally brought tears into my eyes was the final scene of the series. The gentle voice over said that this series is dedicated to all those lost, and all those who suffered, not just during the war, but also for the decades afterwards caused by the war, including raditation poisoning in Japan. That wasn't it though. It was when the voice said that we should be grateful to the cameramen, "the unarmed heroes who recorded these images for posterity." The rise of Nazism was pretty much the catalyst when the visual medium became a standard. Hitler's propaganda minister, Dr Joseph Goebbels, recognised the power of this medium and adopted it right at the beginning of their terrible reign over Germany, already in the 20s. The first Olympic Games to be broadcast on television (so new at that time that the Nazi government had to install them in public areas for people to watch, no TV in the living room as such) was the 1936 Berlin Games. Those images of millions saluting the moustached dictator filmed by Leni Riefenstahl for the seminal film, Triumph of the Will, is still able to bring a sense of occasion even now because the art of films took an extraordinary leap forward thanks to Riefenstahl's innovative techniques. However, never has this medium been more effective than from these amazing archive footages. It's simply amazing to think that some of these brave cameramen had the foresight to make an incredible contribution to world history, that they lugged bulky cameras and film reels around with them to the bloodiest battles under most distressing and dangerous conditions. This documentary is a must watch, even if you are not a history nut like me. It's a must watch because this part of history is important. This part of history defined, and continues to define, our lives, our culture and our world for the past seven decades. As the world moves closer and closer towards yet another global crisis, there are so many lessons we can learn by just looking back at history and trying to prevent the same mistakes from happening again. If there are any faults with this series at all, and I can only point out one example, it's that the focus is too centred on Europe and American involvement. The Asian part of the war got some airtime but only to a certain degree with the focus on Japan. China played an equally important role in the war and a deeper insight into that would have made the documentary complete. Please, take some time out, and watch this documentary. Understand what the war was, and what it meant. Thank you Jean-Louis Guillaud, Henri de Turenne, Isabelle Clarke and Daniel Costelle (producers and writers of this documentary). You've made an amazing mark in history, retelling the story which almost seems forgotten nowadays. You retold this truly epic world journey in such clear and mind blowing terms, making it easier for the general audience to understand. If this series does not become a standard in history courses, I'll be severely disappointed. Armistice Day is next week (November 11 if you didn't know). Barely two decades passed between the end of the Great War and when the next World War broke out and plunged humanity into darkness and terror again. Take stock of what our world has been through when we remember the fallen next Friday. But, most importantly, take stock of the great achievements we've accomplished since then. Let's not let all of the good which arose from the ashes of the bad go to waste.